Am I the only one who feels a bit overwhelmed during the holiday season? The shopping, the eating, the cookie making, the endless parties and the decorations (which have taken over my house). Do not get me wrong, I love the holiday season but feel that the pace of it all is a little bit faster than I prefer. I need to constantly remind myself to slow down, enjoy the moment, and breathe. As a mother of two teenage daughters, who love the holiday season, I am thrust into continuing all of the traditions. I continue with the shopping, baking, and decorating for them. I want them to have all of the positive memories that I had during the holidays growing up and have a new-found appreciation of what my parents did during the holidays to make it so special for me. I personally do not enjoy fighting for parking spots at the mall, bringing in the clutter of the decorations, and breaking my budget buying gifts. It takes a bit of work to get the “Scrooge” out of me and to enjoy all that this wonderful season has to offer. I have learned a few things to keep me grounded during the holiday season. Try and keep the holiday simple and be good to yourself. Many people, including me, find themselves overwhelmed during the holidays because schedules go out the window. It is extremely important to pace one self and not overdo it. Try to maintain a schedule for yourself by prioritizing which holiday events to attend. If you are planning the holiday event, keep it simple, for example make one or two types of cookies instead of twelve. Even better, ask your guests to bring something to contribute to the festivities. If you are attending parties, try not to overindulge in fatty foods and sugars as these items have been associated with an increase in depression. If possible, try to keep your exercise routine and spend plenty of time outdoors. Some experts believe that seasonal affect disorder, which is caused by lack of sunlight causing the reduction of the number of endorphins distributed to the brain, can contribute to the winter blues. If you are alone this holiday season, try to reach out to someone else in need. There are many hospitals, food pantries, and local organizations looking for people to volunteer their time. In addition, it may make you feel better to positively influence or help someone during this season. Shopping can be very stressful. Make a list of the people you need to purchase for, set a budget, and stick to it. Keep your costs down as we all need to remember that in this season of giving it could cause financial hardships for some. Many people agree it is the thought or gesture of kindness that really matters and not the amount of money one spends on gifts. Shopping through catalogs or online could also be helpful to avoid the chaos of shopping malls. If you do plan to spend the day shopping bring a healthy lunch or dinner as we all know the quick mall food isn’t going to benefit your well-being. 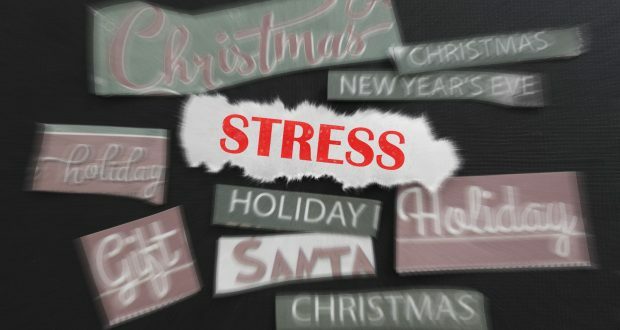 During the holiday season, many people find themselves out of their normal life routines. They may make unrealistic goals for themselves thus setting themselves up for failure. One may look at the overall state of their life over the past year and become depressed at all that was not accomplished. Be real. Start with a simple plan and stick to it. Begin with small steps in order to obtain your larger goals. A little accomplishment may go a long way by giving you the ambition to go even farther. Positive thoughts may help to bring positive outcomes. Some people, such as the elderly, widowers, divorcees and military personnel, feel a real sense of loss during this time period as they get lost in the shuffle. They are now guests at events in which they used to host. They miss the loved ones that may not be around now and depression may be present due to this. If you are this person, remind yourself that it is normal to feel sadness and it is okay to cry. Try to remember your loved ones and the special memories you may hold. Share these memories with others if possible. If you are the younger generation, try to be sensitive to these people during this time and try to include them by making new memories with them. Make them feel sincerely needed and welcome. If possible start new traditions for yourself. In closing, I am going to try to follow my own advice as I enjoy the delicious smell of hot apple cider, fresh fir trees, cookies and cakes baking in the oven. I am going to enjoy the wonderful colors that the holiday brings with the backdrop of snow glistening in the cool, brisk air. I will look forward to family gatherings, new traditions, and being in control of making my own joyful memories of this holiday season. The reindeer frolicking in the snow, the laughter of children anticipating Santa Claus or the presents of Hanukkah. So as I continue on to 2018 I will keep all of these tips in mind that I need to be good to myself, be good to my pocketbook, be realistic, and be kind. Have a happy, healthy holiday and a wonderful new year. Cynthia Niles is the daughter of Karen Giblin and resides in Charlestown, RI.